Arthritis is defined as a group of conditions involving damage to the joints of the body. Arthritis is used to describe over 100 rheumatic conditions and diseases affecting the joints and surrounding tissues, as well as other connective tissues. The most common form of arthritis is osteoarthritis (degenerative joint disease) that results from trauma to the joint, infection of the joint, or age. Other popular forms are: rheumatoid arthritis a systemic inflammatory disorder that may affect the tissues, organs and joints, psoriatic arthritis which causes joint inflammation, autoimmune diseases in which the body attacks itself and gouty arthritis caused by deposition of uric acid crystals in the joint, causing inflammation. The pattern, severity and location of symptoms of arthritis are dependent on the specific form of the disease; symptoms may be sudden or develop over a period of time. The Center for Disease Control and Prevention reports that arthritis is the most common cause of disability in the United States affecting approximately 19 million adults. The joint pain of arthritis can appear as hip pain, knee pain, hand pain, or wrist pain, as well as joint pain in other areas of the body. Joint pain, stiffness and/or swelling that last for more than 2 weeks may be an indication of arthritis; persons experiencing these symptoms should consult with their doctor for a proper diagnosis and about any home treatments that are undertaken including diet. Foods rich in omega-3 oils are recommended for persons with arthritis. Omega-3 can be obtained from salmon, sardines or other oily/fatty fish. Cod liver oil is also good and should be taken with a teaspoon daily. Beta carotene, vitamin C, and other antioxidants reduce cell damage. Fresh green and yellow vegetables are rich in these substances. Grapefruit and other fresh fruits for citrus flavonoids, substances that are thought to increase the antioxidant effects of vitamin C; may have an anti-inflammatory effect. Eat daily. Apply cream containing capsaicin to painful joints. Capsaicin is absorbed through the skin and reduces inflammation. Maintain a healthy weight to avoid stress on the body’s joints and bones. Ease pain and increase circulation to the joints with a heating pad or hot bath. Heat will also help joints that are hot. Reduce swollen joints by soaking them in cold water or applying an ice pack. Add ice immediately to an overworked joint to avoid swelling and leave on for twenty minutes or more. 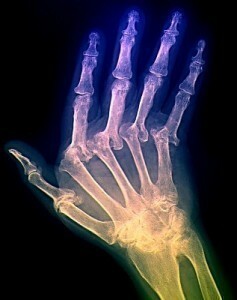 Research links rheumatoid arthritis to vitamin C deficiency. Take a total of 500 mg. of vitamin C spread out in small doses throughout the day. Acupressure – Acupressure improves blood circulation for rheumatic conditions. To soothe discomfort in the neck and lessen the general irritability that arthritis pain can cause, use your thumbs to press what is known as the GB 20 points. These points are situated below the base of the skull, two inches out from the middle of your neck. Press for one minute. Work on these points regularly, several times each day, in combination with other therapies. The GB 20 point is a good overall pain-relieving point and is one of the several anti-inflammatory points. Aromatherapy – Add six drops each of rosemary and chamomile essential oils to four ounces of oil such as almond, avocado, soybean or sesame. Massage the oil combination into sore joints. For extra relief, add ten drops each of rosemary and chamomile to a warm bath and soak for ten minutes. Yoga – Yoga works with the body’s energy. It encompasses a lot of breathing techniques and stretching. Stretching can make the muscles around the knees strong and would help to ease arthritis pain in the affected area. Patients would eventually feel more comfortable with the use of the legs thereby building their strength and resistance to injury.